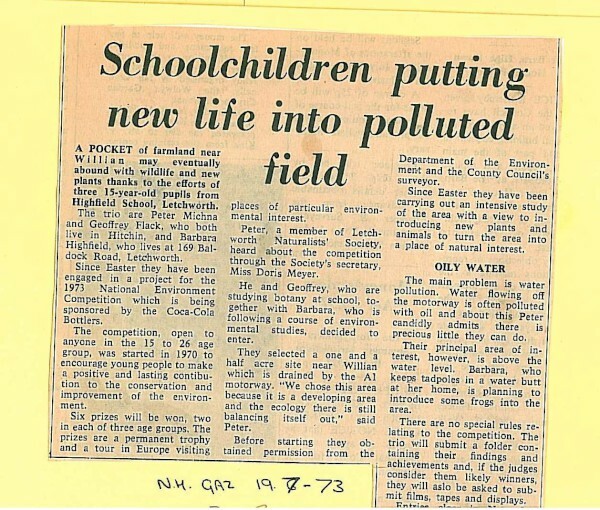 A newspaper cutting reporting on a packet of farmland near Willian which may eventually abound with wildlife due to the efforts of three 15 year old pupils from Highfiled School, Letchworth. Peter Michna, Geoffrey Flack and Barbara Highfield have selected a one and a half acre site near Willian which is drained by water flowing off the A1 Motorway and which is often polluted wifh oil. The three students are entering their project for the 1973 National Environment Competition which is being sponsored by the Coca-Cola Bottlers. The newspaper cutting is taken from the North Herts. Gazette dated 19.07.1973 and has yellowed with age and is mounted on yellow card.